If I could live anywhere in the world, it would have to be Paris, France. I’ve been fascinated with the French culture since 7th grade. Maybe it’s because of my love for fashion houses like Chanel and Louis Vuitton, or perhaps it’s just the romantic feel I get when thinking about the city, but whatever it is…the saying “I left my heart in Paris" is true. I fell in love with Paris and the chic, yet laid-back lifestyle of the Parisians and I want to return every year. My first time in Paris was back in 2009 after my college graduation. After that trip, I knew that I wanted to celebrate the big 3-0 in Paris. Fast forward to this past year and the planning began. I’m fortunate that some of my closest friends decided to make the hike out to Europe with Eugene and me to celebrate. We started our trip with three days in Iceland, three days in London and wrapped up with three days in Paris. 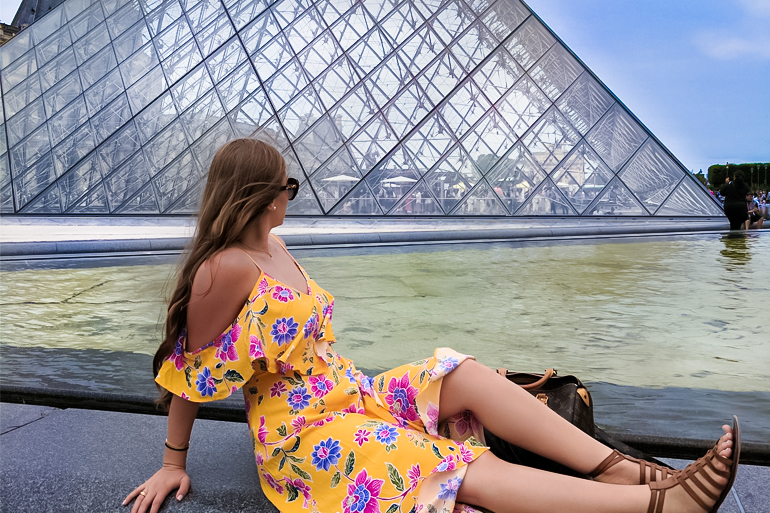 Paris has so much to enjoy, from the fantastic cuisine to the magical sights of the Eiffel Tower, the Arc de Triomphe, the Louvre and so much more. When planning this trip, I wanted a more laid back Paris experience. I’ve already been to the museums and learned a ton about the history of France. This time I wanted to roam around the city and immerse myself in the culture. Our group was traveling from London to Paris via the Eurostar train that connects the two countries. The ride was about 2.5-hours. What’s interesting about this route is that the train goes under the English Channel, about 246 feet below the water’s surface. The train only spends about 20 minutes under the Channel, in a pitch-black tunnel, but it was still pretty fascinating. While in Paris we stayed at the Le Derby Alma, a 4-star boutique hotel, blocks from the Eiffel Tower. While the rooms were pretty small, the hotel and the service were impeccable. The location was also prime, as we were walking distance from the Eiffel, Champs-Élysées, many restaurants, and other landmarks. Eugene and I scored a room with a view of the glorious Eiffel and were able to watch the tower sparkle each night before going to bed. Others in our group got a suite with upgraded accommodations, including a free cell phone with data to use during the stay. We happily used the phone on several occasions, whether it was to make/change dinner reservations or to find our way when we lost WIFI. This was a great perk courtesy of the hotel and much appreciated. Our first adventure in Paris was a food tour through Montmartre, a neighborhood in the 18th arrondissement of Paris. Montmartre is famously known for its gorgeous church—Basilica du Sacre-Coeur de Montmartre, as well as being the home to many famous artists like Claude Monet, Pablo Picasso, Salvador Dali and Vincent van Gogh. I booked our food tour through Secret Food Tours. The company also offers many tours throughout some major European, Asian and US cities. We had a great experience on the 3+ hour excursion, making several stops to try different chocolates, macarons, cheeses, salamis, crepes, and baguettes. After enjoying a wide variety of samples, our tour guide purchased several other items and brought us back to the tour offices to continue the French food experience. We spent the next hour or so talking to our fellow tour mates and drinking lots of wine! Afterwards, our group stumbled back to the streets where we wandered up the famous hill of Montmartre to capture some stunning views of the city. We sat around for at least an hour watching the bustling herds of tourists and locals enjoying drinks and different foods on the steps. People watching at its finest here. There are a ton of stores, delis, restaurants, and markets throughout the tiny cobbled streets of Montmartre to check out. The neighborhood itself is very picturesque, and it was a perfect Parisian experience. The next day was my birthday. I couldn’t have asked for a better day! First, it was one of the very few days we actually had sun on our entire trip and secondly the whole day was just a blast. We started with a French breakfast in a small café in the heart of Paris. We filled up on salmon and eggs, baguettes, croissants and freshly squeezed orange juice. Our next action item of the day was the hop-on, hop-off bus tour. Many cities have these buses available, and it is a great option to see the city during a short visit. I loved being able to spend a couple of hours riding around and stopping and traveling at my leisure. The buses come by every 5-10 minutes and stop at almost every single major landmark in the city. Headphones are provided as well for those that would like to have an audio tour to go with the sights. We got to control how much time we spent at each stop and didn’t feel rushed. I was the only one in our group that had already been to Paris, but everyone agreed that this was a great way to see the city. Following the bus tour, we made our way to Champs-Élysées, a well-known street in the 8th arrondissement of Paris. It houses many luxury and retail stores, as well as cafés, including the world-renowned Ladurée, where we enjoyed my birthday lunch. The restaurant décor is vibrant with a mix of blues, pinks and lots and lots of gold. It totally reminded me of old French Royalty. There is also an attached bakery for those seeking to purchase macarons, but the line seemed to go on forever. We discovered that there are Ladurée stands at both airports, so we did not buy any until the flight home. For dinner, we had reservations at Caviar Kaspia, a restaurant specializing in caviar and Russian dishes. I found out about this restaurant right after my first trip to Paris. They are famous for their $100 black caviar baked potato. Apparently, the place is also a favorite among celebrities, including Beyoncé and Jay-Z, so you know I had to see what all the fuss was about. From everything I had read, the restaurant reservations book up far in advance, so I had emailed them for a booking around March/April, for our July trip. Once we actually got there, the restaurant was surprisingly empty. There were 2 other tables besides ours at the time. At the end of our meal, the servers brought out a large sheet cake with candles and sang “Happy Birthday”. They took the cake back to the kitchen, where we thought they were cutting it up for the table, but they never ended up bringing it back out—this became known to our group as “fake cake gate”. It was pretty disappointing to spend over 500 euros on dinner and not been given a free birthday treat, but oh well! Overall the food was amazing and everything I could have dreamed of for my birthday celebrations; however, the place is extremely expensive! Our last stop for the night was an evening cruise down the Seine River, which was included in our bus tour purchase. We originally weren’t going to go, but I’m glad we did. Seeing the city at night was stunning. The Eiffel and pretty much every building were lit up. Watching the lights dance from the banks of the river with the Eiffel in the background made my heart whole. Once we got back to our hotel room, there was a gorgeous bouquet of red roses waiting for me. Eugene surprised me and ordered some from the hotel! These were legitimately the most beautiful red roses I’d ever seen, so naturally, I had to have a quick photoshoot. I’m so lucky to have been able to spend my 30th birthday with my husband and friends. Our final day in Paris was dedicated to sightseeing the town of Versailles. I booked our group on a bike tour through Fat Tire Tours. This was one of my favorite parts of our stay in Paris. The tour was an all-day experience and included train tickets to Versailles, which is about 40 minutes from Paris. We spent several hours riding around the town and the markets, where we picked up wine, baguettes, cheese, and salami for our picnic on the palace grounds. This market is also where I had some of the best sorbet of my life, as well as an amazing French crepe. Our Brody Jenner looking tour guide was knowledgeable and provided some great background and insight into the history of King Louis XIV and the construction of his majestic palace. “Brody Jenner” took us through the back end of the palace, helping us all sneak in our purchased snacks and wines. Typically you are not allowed to bring in wine, as the security guards search your bags, but we got a pass. Our group was lucky enough to enjoy a picnic right on the palace grounds, surrounded by King Louis’ manmade lake. Great experience! The palace itself was our last stop of the tour. By this time our group was tired not only from biking all day but also from drinking wine during our picnic feast. Although we rushed through the palace a bit faster than I would have liked, we still got to see quite a bit. The Château de Versailles is jaw-dropping, magnificent and unlike anything I’ve seen (and I’ve seen a lot in Europe). It is a must-see stop while visiting Paris. The fact that this palace was built in the 17th century is insane. The sheer size and architecture is unreal. The palace actually started as a hunting lodge for King Louis XIII. After his death and once his son, King Louis XIV took the throne, he transformed the lodge into this grandeur estate. The palace has over 700 rooms, 1,200 fireplaces, and 60+ staircases. The grounds are home to thousands of exotic trees, over 1,200 fountains, a lake, and an orangery. I wish we had more energy and time to explore the rest of the gardens, but we really would have needed an entire second day. The lifestyle of King Louis XIV was the very definition of extravagant. Eugene and I were so enthralled by the history and opulence of the palace; we started watching the show Versailles (season 1 streaming on Netflix). I highly recommend it! I’m not one for period dramas, but this one is legit. They even film many scenes at Versailles! We wrapped up our last day with dinner and a walk through the heart of Paris. Eugene and I stopped to put a lock on the famous love bridge. During our stay in Paris, we spent a ton of time just walking around and admiring the city. Since our hotel was centrally located, we were in the heart of Paris within minutes. Besides walking, we also used Uber quite frequently. Throughout the three days, we didn’t have any issues with transportation, besides the first day, when our driver took us entirely in the wrong direction, but that could have been our fault as well. The weather during our trip was chillier than I had expected in late July. We were in the mid to high 60s pretty much all three days. It seemed more like fall than summer; there were a ton of leaves on the ground around the city. As I mentioned at the beginning of this post, there is just something about Paris that makes my heart happy. It truly is the city of love. I’m looking forward to turning 31 in Paris this year.